As part of exploring the theme of “The earth is the Lord’s” this Lent a group from St John’s Parish Wynberg visited the Philippi Horticultural Area (PHA). The PHA is unique and irreplaceable. Numerous studies over the decades, including those by the City and Province, all agree that the PHA is the best agricultural land to provide the city with affordable and local food now and in the future. 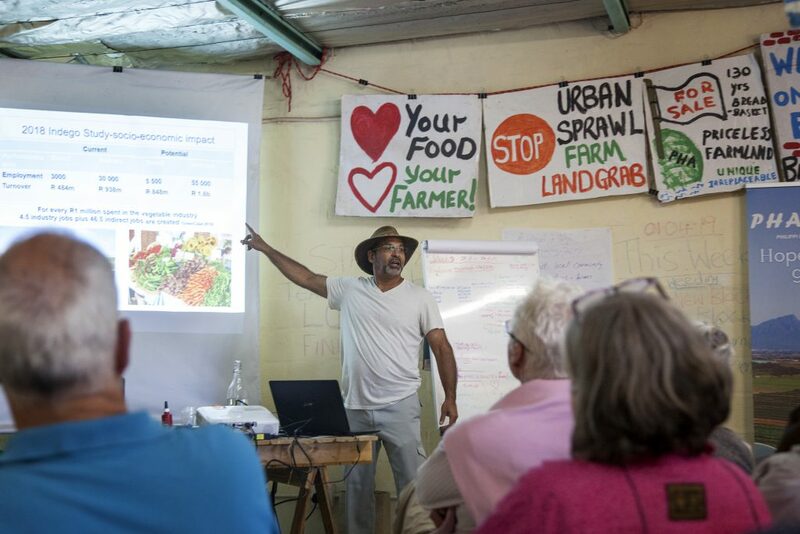 Small scale farmers are fighting to protect the PHA from being developed and allowing this prime agricultural area that is also vital in recharging the Cape Flats Aquifer, to be “paved over”. Preserving and protecting this area is also vital in addressing climate change. Destroy it and we will be shipping in fresh vegetables from George and even as far as far afield as China and New Zealand. Imagine the food miles added to our daily food and how that will add to our carbon foot print. Not only can the PHA farmers provide healthy organic food they also create employment and food for people who cannot afford to shop at Woolies, PnP, Spar and Shoprite. A third of the PHA (1,000 ha) has already been lost. Irreplaceable farmland has gone for ever. Our Lenten journey, using the 2019 Lenten material, has awakened us afresh to our calling as disciples of Jesus to protect and honour God’s gift to us in creation. God so loved the world (the earth, literally the cosmos, not just the people on it) that he sent his Son so that we (and the earth with us) might have life in all its fullness. As a Parish we stand with the PHA Farming Campaign in working for the preservation of this food basket on our doorstep that provides over 80% of Cape Town’s fresh vegetables. We are behind this campaign supporting the court battle and creating awareness of what is happening under our noses. We also want to share the exciting vision of what could happen in the PHA. Can you see it: small scale farmers producing wholesome food, reducing carbon emissions, creating employment and using this God given gift to enhance the lives of all who call Cape Town home?